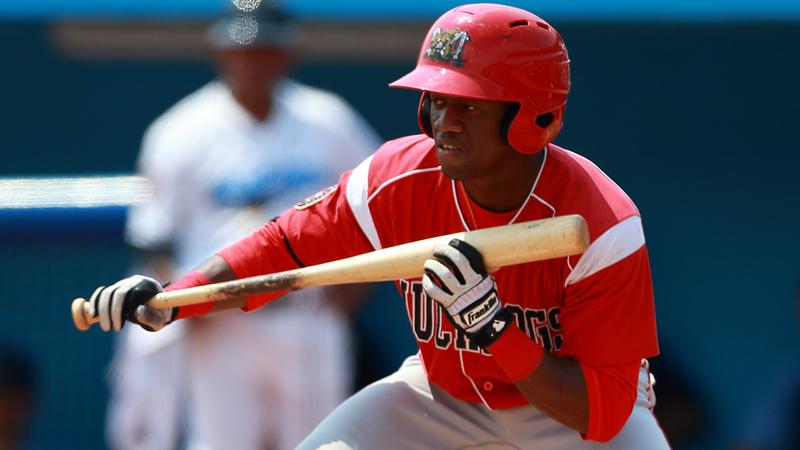 Energized by atmosphere, the speedy Anfernee Seymour is coming into his own for the Batavia Muckdogs, two or three bases at a time. After debuting in the Gulf Coast League last season, the Bahamian is finding that life at the next level has all sorts of surprises in store, including love from the supporters and opponents focusing on his dangerous speed. "Where I was last year, there was no one to really play for," said Seymour, who hit .245 and stole 11 bases in 26 games for the GCL Marlins last year. "So you really have to focus and get zoned in. Now that you have fans, you have something to play for -- people cheering you on. It's really fun and really makes you want to play every day. I didn't know I had this many fans." The humble 20-year-old is poised to make many more fans along the way as he flashes a blazing speed that is at the forefront of his array of tools. The Marlins' No. 26 prospect grades out at 80 in running, and though the New York-Penn League was aware of Seymour's ability on the base paths, they've had plenty of trouble stopping him as he continues to fine-tune that aspect of his game. "Speed changes the game," said Seymour, who has been clocked at 6.24 in the 60-yard dash. "I've noticed pitchers won't throw me too much offspeed -- they'll try to make me get myself out. Infielders come in, play halfway; outfield comes and plays halfway. When I get on base, pitchers slide-step -- they don't really hold. Everyone here, they've already got the memo that I'm fast, so you've got to be quick, you've got to watch out. It's no secret now. I've just got to play every day, try to find a way on." While the wheels are tightly fastened, Seymour is still a work in progress at shortstop, a position he never played prior to becoming a professional. The Marlins liked the range and arm he displayed in the outfield and thought he would fit nicely in the middle of the infield, so he started the transition last year, playing seven games at the position. This season it's been strictly shortstop for Seymour, and though he's made 10 errors in 121 chances, he has been in the mix of 16 double plays and has a .917 fielding percentage, up from his .840 percentage at short last year. "It's a challenge, but I'm definitely up to it," said Seymour, a seventh-round pick last June out of American Heritage High School in Delray Beach, Florida. "I'm just working every day to get better. It's obvious they know what they're doing with me, so I'm just trusting the process and going with the flow." Overall the process is working just fine for Seymour as he has hit .298 with a team-high 19 runs scored and 14 stolen bases in 17 attempts. "I'm getting used to it," said Seymour. "Now, it's more fun playing every day, playing under the lights, playing the game against real good competition. It's feels good and I'm enjoying myself and working hard every day." Smooth criminal finally caught: Following 15 straight successful steal attempts to start his professional career, Tri-City outfielder Johnny Sewald was finally cut down Monday night. After drawing a two-out walk in the third inning of the ValleyCats tilt with Aberdeen, he was thrown out attempting to steal second by Ironbird's catcher Stuart Levy. Sewald, who led Arizona State in swipes the past two seasons, had 21 in 31 attempts for the Sun Devils before being selected by the Astros in the 14th round this June. His 15 steals are a league best, as are his 20 walks. Kings of the hill: With just over 30 games played by each team, the Brooklyn Cyclones have taken their place atop the pitching leaderboard. The team has a league-best 2.62 ERA (second-place Williamsport has a 2.95) and a 1.11 WHIP, led by Gaby Almonte's 2.78 ERA (11th lowest in the league) and Tyler Badamo's league best 0.98 WHIP. Since 2010 the Cyclones have lead the league in ERA three times (2010, 2012 and 2014) while finishing second in 2013 and third in 2011. High-tide hitter: Vermont's Mikey White saw his 17-game hitting streak come to an end Tuesday after going 0-for-4 versus Auburn, but he couldn't be held down for long. Oakland's second-round pick out of Alabama in June started a new streak the very next day by going 2-for-3 with an RBI and two runs scored, running his batting average to .340. White has hit safely in 22 of his 26 games since starting his pro career, collecting nine multi-hit games and 12 extra-base hits for the Lake Monsters.